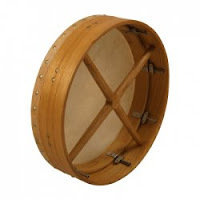 In preparation for sabbat Lughnasadh, the upcoming Celtic fire festival which marks the beginning of the harvest season, I've acquired my first ritual drum - a tunable Celtic bodhrán made with a natural finish mulberry wood frame and a goatskin head. It's an instrument of most high beauty. So simply perfect! Interestingly, most of last week I was bedridden with a nasty case of the flu, waking up one morning from a dream with a wizard's cauldron brewing up fiery energy in it  and feeling like my throat was on fire. The sore throat has since resolved. I am still recovering from the cough and congestion, though those have very much improved such that I no longer feel so weak as to be bedridden. I am healing and more importantly, my throat and the path of my voice have been purified by fire. This instrument is a gift of Goddess to me. I didn't eat any of the stew-like concoction brewing in the cauldron, as there was fire in my throat already and the stew didn't appear appetizing to me on account of that. Also in the dream, I threw one of my pearls into a magical pool of magical water. Like Excalibur, only my chosen would be able to go into the magical pool of magical water to retrieve it. In follow-up to today's earlier entries, it is interesting that there are 248 dimensions or 'parts' (חלקים) which describe the mathematical group called the E8 Lie (pronounced Lee) group upon which the forces of physics may finally become unified. Interestingly, none of today's entries were planned - they all flowed effortlessly from one another, catalyzed from The Best Part and a comment in response to that entry, into The Science of Scent, into The Five Elements Of Scent, into Eight Charge Dimensions Of Everything, into Co-Determinants Of The History Of The Universe into this entry, 248 Dimensions. There are 248 positive (masculine) mitzvot in Torah. Whereas the first five of today's entries wandered around aspects of the Divine Feminine, the 248 dimensions of the E8 Lie group wander around aspects of the Divine Masculine. Thus, not only is there mathematical beauty in this new theory regarding the nature of the universe, but unity is also brought to the Divine Feminine and Divine Masculine forces which bring nature into manifest being. The two words in parshat Korach which initiated all of today's entries were את-חלבו. As well as functioning as a sign of the definite direct object 'the', at (את) is also the feminine Hebrew form of the pronoun 'you'. The word חלבו has a masculine Hebrew letter suffix which renders the word to mean 'his best part'. Taken together, the two Hebrew words of the joined one-word construct את-חלבו unify the Divine Masculine and Divine Feminine forces of nature just as does the E8 Lie group theory. Moreover, the unification was elucidated in today's entries in exactly the same feminine to masculine order as the two magical Hebrew words, namely את-חלבו, abstracted from Korach for my Torah commentary entry. As the five primary elements which comprise the molecules we perceive as scent through the sense of smell are numerically related to the Divine Feminine by way of the 'feminine' number five (through the magical Hebrew letter hei and the sefirot Malchut and Binah), so too are the eight charge dimensions which are theorized to comprise everything related to the Divine Feminine by way of the 'feminine' number eight (through the magical Hebrew letter chet and the sefirot Binah and Hod. Nitrogen, carbon, hydrogen, oxygen, and sulfur - these are the five primary elements which comprise the molecules we perceive as scent through the sense of smell. Commentary on Korach from Garden of the Dark Moon Jubilee ... The Best Part. I have a terrible sore throat and cough today. It kept me awake all night and much of this morning. After deciding I couldn't go to work today, I tried to get some rest. As I lay in my bed with a nuked sinus pack over my face and a mentholated cough drop in my mouth, I had a vision. I was standing beside a King in his royal finery on a shore. I was wearing my own royal finery. I felt like the Queen of Sheba somehow. We were facing out looking into the body of water-likeness as many other people stood around behind us and watched. The water in the river off the shore wasn't water. I wasn't sure what it was, but it had a smooth flawless surface and glistened like colorless silver. It was all pure silvery-whitish yet also colorless looking. With my hands loosely clasped in ease behind my back, I reached out with my right big toe and dipped it into the water-like stuff in the river. The surface didn't ripple like water might. Rather, it moved more like an energy plasma of some sort. The water-like silvery-whitish but also colorless stuff reminded me of pure liquid mercury, only it wasn't heavy like liquid mercury at all or quite as dark in color. It had a very light density, lighter than water, more like air or light gas. Then the vision changed and I saw a tunnel in my cave with someone coming through it toward me. Coming around the bend of it, he looked up at me right into my face, eye to eye. Mercury's atomic number is 80 (פ). Elemental mercury has no electric charge - it is neutral. Mercury can exist in two (positively charged) cationic states, namely Hg2+ (mercuric) and Hg1+ (mercurous). Mercury is not biodegradable. It can be converted among its various range of forms only through abiotic and biogeochemical transformations and through atmospheric transportation. represents all knowledge, a sacred place where all is linked and becomes clear in togetherness and unity - just as the old Groves contained tree sense and bound their users together in a common purpose ... the Grove gathers together for your journey all the knowledge hidden in the trees. It holds comprehension of all that you already know or are capable of learning. What beautiful magic are the Oghams bringing forth for this summer solstice sabbat! 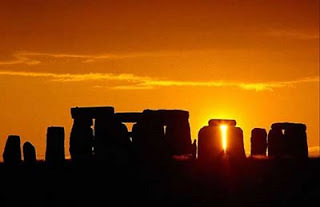 May your summer solstice celebrations be blessed with all good! Today I initiated my newest card deck consisting of Ogham letters, the Celtic Tree Oracle. Just now, during the planetary hour of Mars (ג), I opened my new deck, shuffled the cards of magical Ogham letters, and drew out one card - drawing forth with it, the initiatory energy which shall characterize this deck. are inheritors of the knowledge of measurement and calculation of the earlier 'dodmen', the prehistoric surveyors of the ley lines and trackways portrayed in the ancient chalk-cut figure of the Long Man of Wilmington, shown holding staves or rods. Also skilled in the Law, the Druids were called upon to mediate disputes concerning property and land boundaries, much as present day surveyors. In other words, the magic of this card pertains to laying out mystical pathways and setting up the boundaries of the Land. This card Coll resonates in perfect harmony with my earlier parsha entry about the Land - Walking With Giants. The word dodmen comes from the Welsh word dodi meaning to lay or place. Coll means life force within as a channel for creative energy, to catalyze and mediate manifest transformation. Commentary on Sh'lach from Garden of the Dark Moon Jubilee - Walking With Giants. Well done in-depth examination of the witch-hunts that swept Europe and resulted in the torture and burning of women at the stake. I and my three children were living in a house I used to live in on a street called Orchard View. It was night and we were all sleeping. Suddenly, the phone rang and woke me up. I answered it. A frantic caller scolded me for sleeping when there was a terrible storm brewing up outside. The caller told me I should be preparing for the terrible storm and getting my children to safety, then hung up. I didn't sense any terrible storm brewing up outside. Nevertheless, I decided to take a look outside just to be sure my children and I were safe to remain where we were. I got up, went to and opened the front door, stepping halfway outside onto the porch. I looked up at the dark night sky. It was still very dark outside, but there was no terrible storm brewing up. It was a peaceful quiet night. In fact, I felt nestled and tucked away in a cocoon of peace. No need to worry - my children and I are quite safe. As I turned to go back inside, I saw that a note had been tacked onto the outside of the door. I pulled it off and took it inside to read. Turning on the kitchen light, as I read the letter, I 'saw' the sky outside open up and in it were myriads of 'angels' flying about, all clothed in white. My oldest son (as when he was a little boy) came into the kitchen. We put together a small white clothes dresser for my daughter's room, before returning back to sleep for the rest of the night. In follow-up to my earlier entry, Some Fast-Action Success!, I just have to share what I've purchased with the money from my big sale. 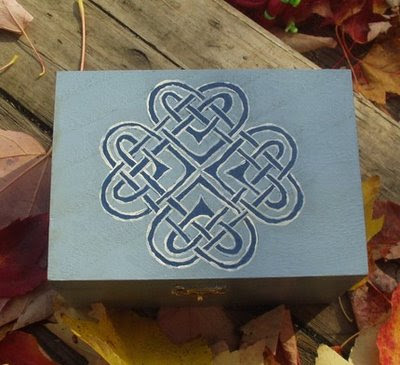 First, this Celtic Hearts True Blue Box, a handpainted sky blue treasure box adorned with woven Celtic hearts. It colors me with the Eternal Innocence of my childhood. Second, this feminine Elegant Woman necklace. It's also handmade. Constructed with 6mm creamy white Swarovski pearls, it holds a sterling silver Star of David. The necklace is 25 1/2 inches long and closes with a sterling silver toggle. I've had both of these items in my favorites list at my etsy for awhile, and now I've purchased them with money earned by my own handcrafted witchcrafts. 35: And it was with the going forward of the ark [that] Moses would say [lit. said] 'Arise Lord and your enemies will be scattered and those that hate you you will flee before you'... 36: ...and when it rested, he said [lit. will say] 'Return Lord, [to] the myriads of the thousands [or the tents/troops/families] of lsrael'. Vayikra 10:35-36. Read about the anomaly associated with these two verses here. I saw the most amazing documentary on public television last night called Visions of Scotland. The visions of the land brought tears to my eyes. I wept - the land is not only so very beautiful, but it touched something deep inside that I can't quite articulate. I literally felt myself being pulled up and toward it inside out. I have no Scottish ancestry that I am aware of for sure, though my paternal grandmother's maiden name is Wallace, which may hold some clue. I know I have Irish and Welsh ancestries, but maybe somewhere down the line, there may be some connection to Scotland as well. Clan Wallace is a Scottish clan, according to the documentary. A clan of the Scottish lowlands, Clan Wallace originally came to Scotland from Wales! These are the six (דגלים) tartans of Clan Wallace. The Wallace surname in Gaelic is Uallas. The motto of Clan Wallace is Pro libertate (for liberty). In follow-up to my earlier entry on Garden of the Dark Moon Jubilee, Seed Of Success Magical Manna - simply making the Seed of Success Magical Manna spell mix (which the witchy Torah commentary introduces) brought to me some immediate success! Side by side, as I wrote the commentary, I made one spell mix for myself as well as one spell mix for sale at WITCHCRAFTS by Liorah Lleucu. Four of my higher priced items at WITCHCRAFTS were just purchased! That's fast-action success! My shoppe WITCHCRAFTS by Liorah Lleucu is not at all a high-volume shoppe. My shoppe is designed as a low-volume "sharing my love of the craft" sort of shoppe, so the big sale I just had has not been typical for the sort of shoppe I have. Commentary on B'ha·alot'kha from Garden of the Dark Moon Jubilee - Seed Of Success Magical Manna. I was swinging (by something like a cord tether) and flying around a lilac-like bush in the yard. The bush was like the lilac bush I've written about before, but it was not that lilac bush, and it was in an opposite portion of the yard. I was wearing a long beautiful white lace vintage chemise-like gown. It was a bright, sunny early summer perfect day with a fresh smell of newness in the air. The day smelled like days smelled when I was a little girl (although I wasn't a little girl in the dream). The day had vitality. The impression arose in my mind that there might be insects or a nest of spiders in this particular bush, although I could see none. Even though I could see none, as I encircled the bush several times, the impression of infestation remained and could not be shaken. I decided I should try to move away from this bush. It wasn't exactly my bush (though it appeared to be) - and it was infested with something. Suddenly, the bush broke in half from where I had been cord tethered to it. The top half flew into the nearby fence while the bottom half remained rooted in the ground. The breaking of the bush released the cord tether (and me with it) from being bound to the infested bush. Yet, even though I had been released, so too had the structure to which I had been bound been broken. The breaking of the structure also destroyed the hidden structure in which the hidden infestation nested. When all the boughs of the bush broke, the infestation had no place to hide. I felt a slight impression of movement on my scalp at the top of my crown. The infestation had left the bush I had broken and jumped onto me! I walked over to my father and had him examine my head - did he see them? He told me they looked like little somethings. So, I went and washed my hair and scalp at the nearest sink in the kitchen. As I began washing it, the swarm tried to escape from being washed off my scalp and down the drain, fleeing in a line onto my beautiful white dress. Oh no you don't - I'd rather be naked than host you! I took off the dress, and with it, off came the entire fleeing swarm. 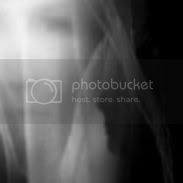 Stepping out the kitchen door onto the porch as I took off and discarded the dress, I opened my mouth to blow out the 'taste' of any infestation and blew out a long tongue of fire - like a dragon might. But the tongue of fire that I blew out was different from a dragon's in that mine was longer, very focused and more controlled. It looked more like a river of fire energy than a flame of fire. The streaming fire energy had no end, rolling out beyond the horizon. Flames of fire drop back from time to time to their origin of burning, but this tongue of fire did not do that - it kept on going and began dissapating from its origin in me. The tongue of fire reminded me of the pulsa denura, a harsh yet protective judgment which issues forth to protect the Divine Feminine. I have no idea where it's going, but two points are certain - the protective judgment has been sent out and it's not coming back to me. My earlier entry (Time For Changes) suggests a Saturn Return-like period in my life, but I'm only 48. Given my age, what is happening right now in my life cannot be clearly linked with a Saturn Return astrological event occurring in my life. Nevertheless, the suggestion bears good fruit. Considering the possibility of a Saturn Return brought to my mind another period in my life which could similarly be described as Saturn Return-like. In the summer of 1996, I "returned to Torah". Thus, 1996 clearly marks an earlier Saturn Return-like upheaval in my life similar to the one of the present time. It is now the summer of 2009 - 13 years later. The 13-year cycle clearly evident in my life may be a microcosmic reflection, first of the 13 katuns associated with the prophecy cycle in the short count, and second of the 13 baktuns in the long count, of the Mayan calendar. According to the Mayan calendar we are currently in the 13th baktun. The 13th baktun will come to a close on on 13.0.0.0.0 (December 21, 2012), turning time over into the 14th baktun. December 21, 2012 is a Capricorn solstice. I was born under the sign of Capricorn. But as written in my previous entry, I have choices. I shall be buried under the sign of Pentacle. Time shall move on. And so shall I. It isn't fate, it's destiny.